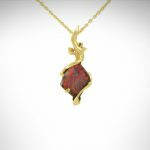 Browse these examples of one-of-a-kind jewelry, designed and created here at Morgan’s Treasure. 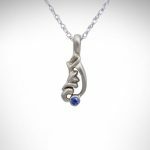 Learn more about the process of creating custom jewelry here. Stop in or Contact us to request a custom piece of your own! 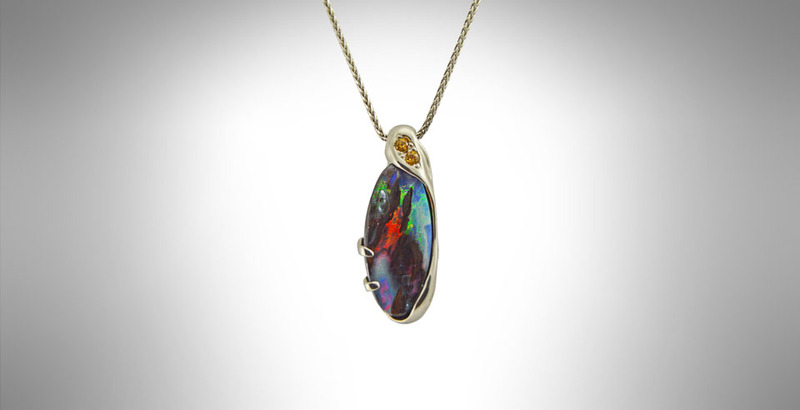 This artistic boulder opal, with brushstroke-like flashes of purple, green, blue and red is accented with yellow sapphires in a 14Kt white gold pendant. 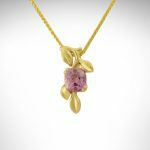 This pink tanzanite pendant is set in 14Kt yellow gold. 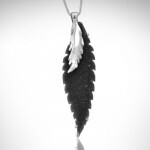 The leaf design makes for a natural feel to the pendant. An understated pendant in sterling silver. 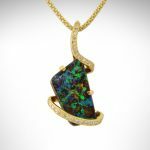 18Kt yellow gold prongs hold a slender boulder opal with undercurrents of teal and violet. 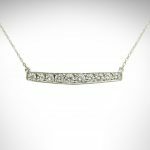 This 14Kt white gold necklace is a great example of re-using diamonds in a piece that can be worn every day. 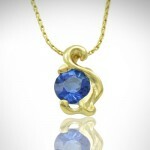 This timeless custom pendant is 14Kt yellow gold with a scroll design. 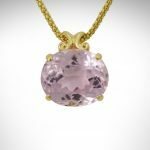 The large, lilac colored gemstone is a Kunzite. 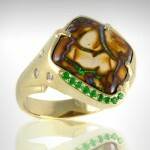 This Boulder Opal ring is set with 14Kt yellow gold. 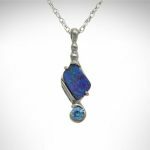 It is set in a partial bezel that helps protect the opal. 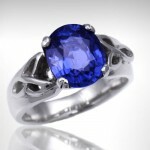 This 14Kt white gold Sapphire Ring has a unique setting complements the blue-purple coloring of the sapphire and shows off the sides of the gem. 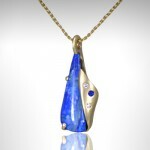 This Boulder Opal and Champagne colored Sapphire pendant is set in 14Kt yellow gold. 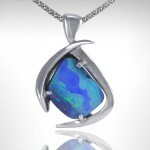 The setting is was made to complement the ocean blue color of the opal. This 14Kt rose gold ring has a large oval Morganite center stone. 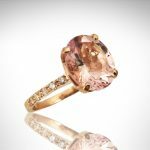 Morganite is often set in rose gold because of the harmonious colors. 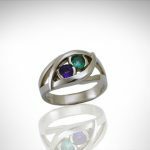 A simple mother’s ring with emerald and amethyst, the two symbolic gems embraced by curving 14Kt white gold. 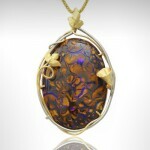 This Boulder Opal is suspended in an orbit of diamonds. 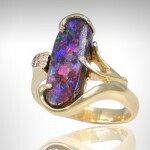 The distinct opal and diamonds are set in 14Kt yellow gold. These two rings were designed to be worn together by a mom who would like to give them to her two daughters someday. 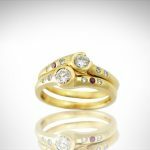 These rings are made with 14Kt yellow gold with diamonds and rubies. 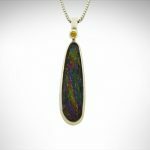 This beautiful Black Opal pendant is made out of 14Kt gold. 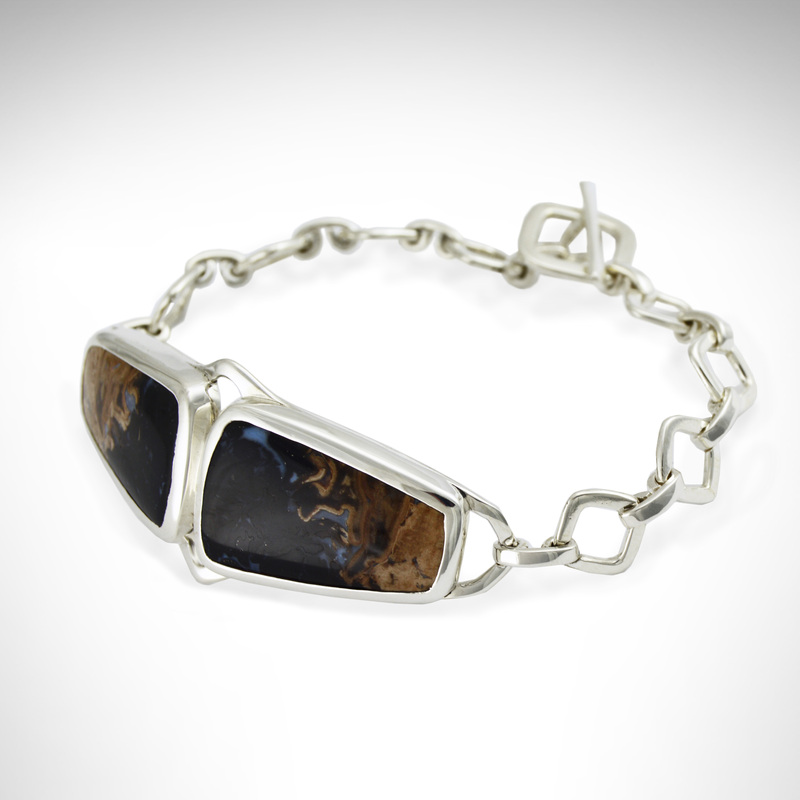 We made it with a design of a birch leaf to complement the exceptional gemstone. 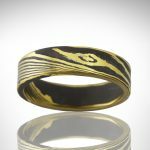 Mokume Gane is a technique using alternating metals fused together and patterned to reveal a unique wood grain look. 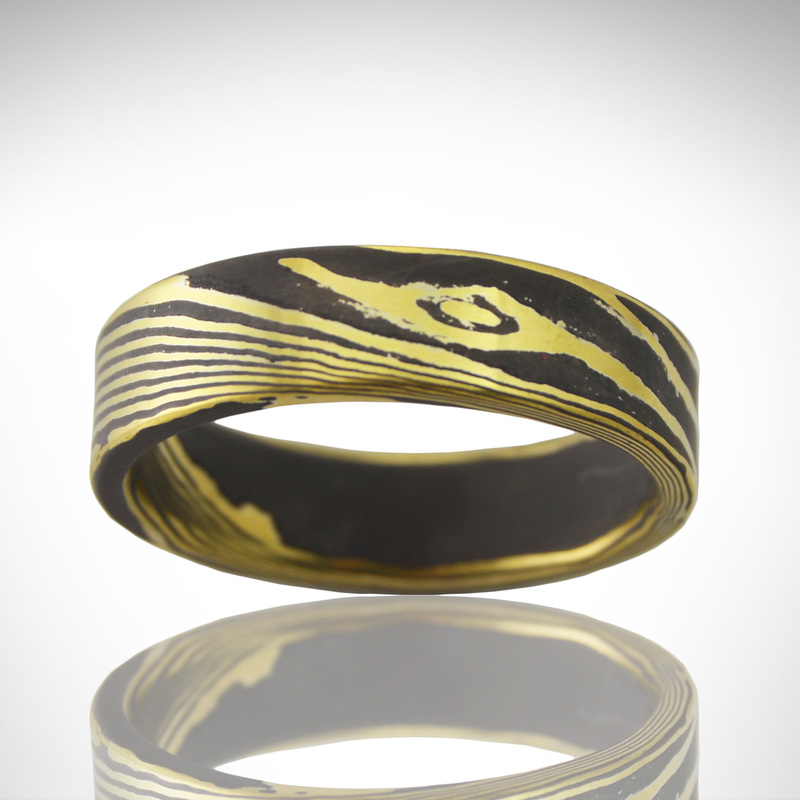 This mens band is oxidized sterling silver and 18Kt yellow gold. 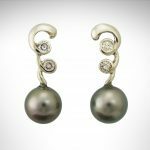 This pair of earring is set in 14Kt white gold with Diamonds and Tahitian Pearls that have been brought to us by the customer. We gave them a fun flow to hold the diamonds. 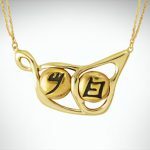 This unique 14Kt gold necklace was designed around beads brought home from Israel- the customer’s initials in Paleo-Hebrew Script. This flowing 14Kt gold ring represents the past, present, and future. It was inspired by a local interpretation of A Christmas Carol and given away in a raffle at the end of the show! 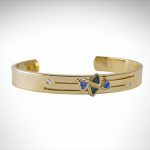 This modern 14Kt gold bracelet has tsavorite garnets, London blue topaz, and diamonds. The simple lines and triangular accents were inspired by the designs of Frank Lloyd Wright. 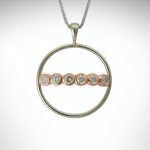 This pendant is 14Kt white and rose gold with diamonds that have been re-purposed from a family ring. 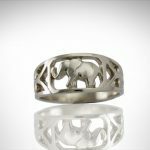 This 14Kt white gold ring features an elephant framed by an openwork design. It was inspired by a ring from the customer’s grandmother. 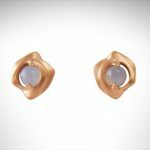 These 14Kt rose gold earrings have a satin finish which complements the water-like translucent chalcedony. 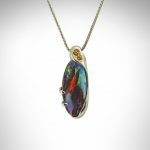 This sterling silver pendant has a beautiful rainbow hematite that sparkles. 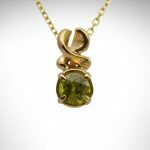 This gorgeous stone was complemented with a yellow sapphire. 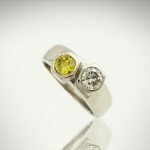 Both stones are in a sleek bezel setting. 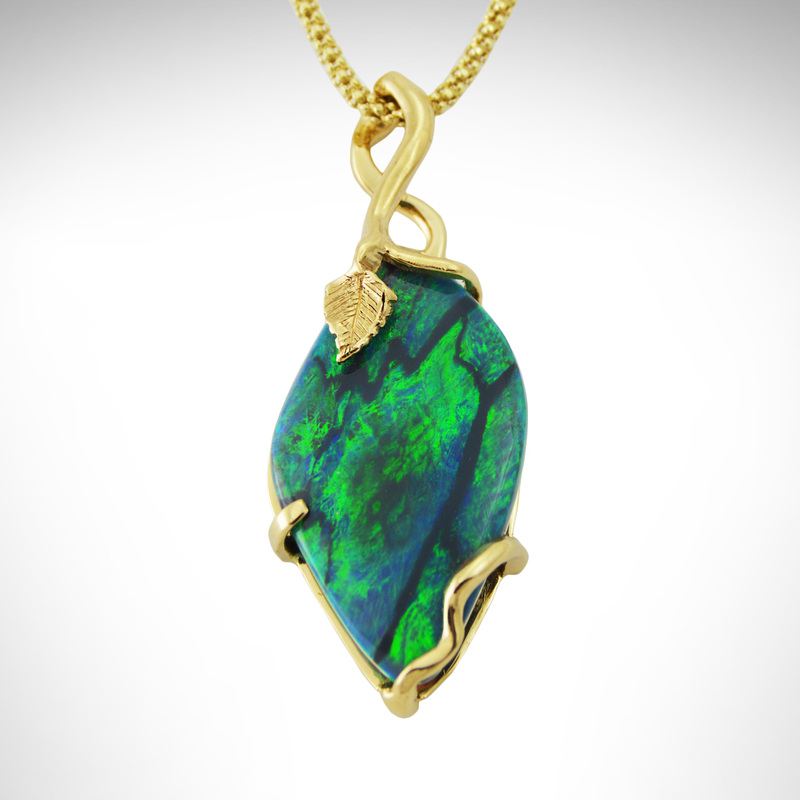 This flowing 14Kt gold pendant features an extraordinary boulder opal. A rainbow effect flashes vibrant colors in the light, including red which is the most rare. 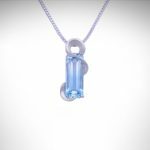 This RARE aquamarine gemstone is a pure blue at the bottom and clear at the top, set in a 14Kt white gold pendant inspired by flowing water. This contemporary band has a striking presence on the finger. 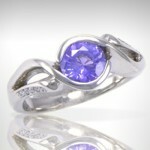 It is set with a unique, natural lavender-colored sapphire in 14Kt white gold. This gemstone has a subtle sparkle of crystals across the surface, and dendritic, or tree-like, inclusions that add a natural design element! The 14Kt gold frames and accentuates the pattern in the gem. 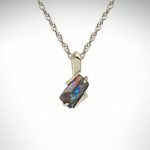 This geometric pendant features a boulder opal with interesting linear details and flashes of color. A modern design in 14Kt white gold. 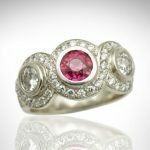 This oval-shaped ruby from Africa is bezel set into a 14Kt yellow gold ring accented with a row of pavé-set diamonds and a ginkgo leaf carving. 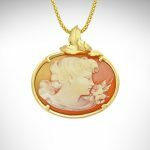 This beautiful cameo was in need of a new setting, so we designed this elegant 14Kt gold frame, inspired by the delicate carving. 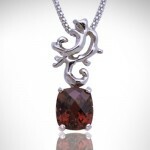 The ornate design of this 14Kt white gold pendant features rare alexandrite. When under a warm candlelight, the gemstone takes on a lovely purple-red hue. 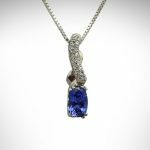 This 14Kt white gold pendant with classical shapes is accented with a dainty, rich blue sapphire. This unique mens band is in 14Kt white gold. The clean architectural design stands out with a bold yellow diamond. 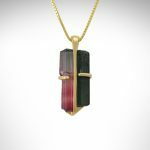 Crystals of pink and green tourmaline hang in a 14Kt yellow gold pendant. Sometimes gemstones are most beautiful in their natural state! 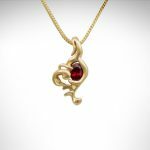 This pendant is set with an oval Burmese ruby in 14Kt gold. The satin-finished setting was inspired by the ornate buildings of Chicago. 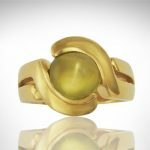 The cat’s eye effect of this chrysoberyl gemstone draws you in as it catches the light. Set in 14Kt gold with a curved bypass design. 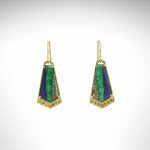 These earrings are set in 14Kt yellow gold with Azurite-Malachite gemstones. This mineral has a rich history, used by Ancient Egyptians for everything from paint pigment to jewelry for Pharaohs! 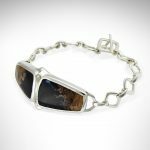 This sterling silver bracelet is completely hand-fabricated, and features a pair of very unique gemstones, cut from a petrified palm tree! 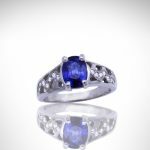 This light blue sapphire is set in 14Kt white gold. 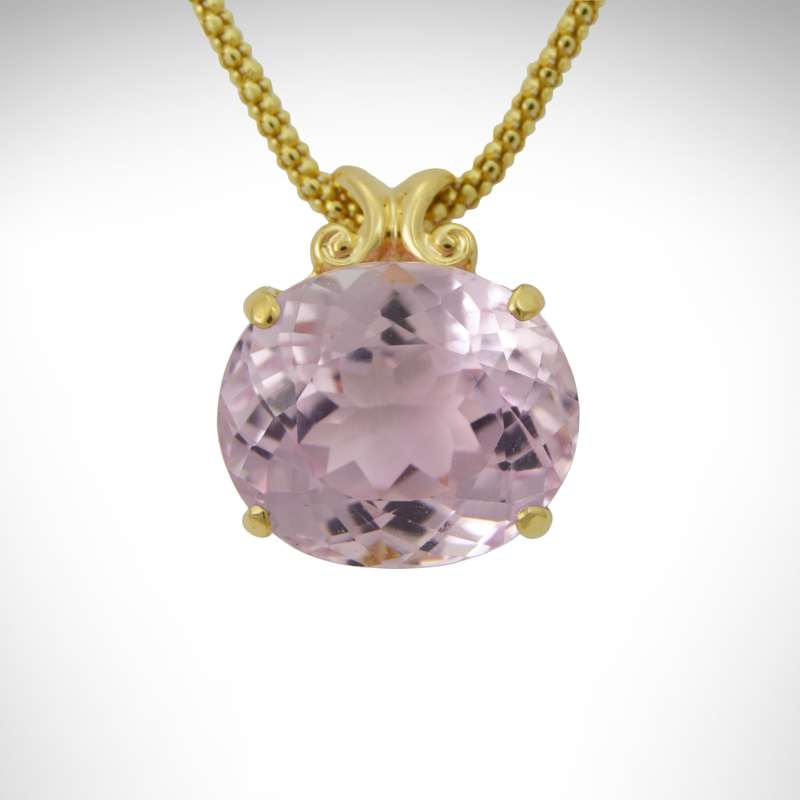 The beauty of this elegant pendant speaks for itself. This ornate 14Kt white gold ring was designed around the customer’s gemstone and features diamonds in a swirling pave setting. 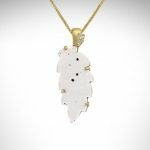 This naturally sparkling white druzy, cut in the shape of a leaf, hangs gracefully from a 14Kt gold bail with 2 diamonds. 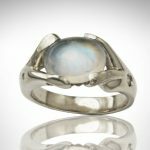 This moonstone, with an almost mystical quality and slight blue tint, is set in a 14Kt white gold ring with a branch-like texture and gypsy-set diamonds. 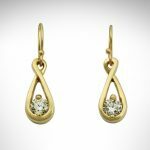 These elegant earrings in 14Kt gold dangle with diamonds cradled in the infinity design. 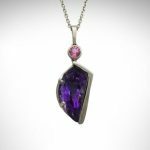 The rich purple of this large, fantasy-cut amethyst is accented with a pink tourmaline in a contemporary 14Kt white gold pendant. 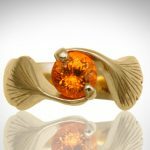 This 14Kt gold ring features a swirl of gingko leaves holding an orange spessartite garnet that glows like the sun. 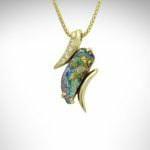 This sparkly druzy gemstone has been deposited with an iridescent satin finish, and the 14Kt gold setting seemingly grows around it like a vine. This lovely blue cushion-cut sapphire is suspended in a 14Kt white gold setting that sparkles with pave-set diamonds. Simple yet glamorous! 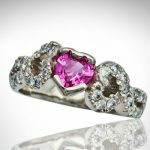 This feminine 14Kt white gold ring, featuring a heart-cut pink sapphire and diamonds, was designed by a young woman as a celebration of all she has achieved! 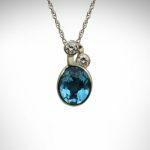 This artistic pendant, in 14Kt white gold, shows off a flashy blue boulder opal and a brilliant blue zircon. This stunning black druzy, with platinum coating its naturally sparkling crystals, doesn’t need any more than an elegant row of diamonds to complete a 14Kt white gold pendant. 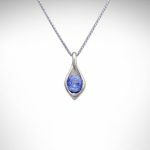 This 14Kt white gold pendant features diamonds and swiss blue topaz in contemporary bezel settings. 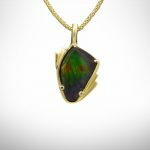 This 14Kt gold pendant is set with an incredibly unique ammolite gemstone. The colors flash as they catch the light and display a pattern like a peacock feather! This fantastic purple-blue boulder opal is set in a 14Kt white gold frame. 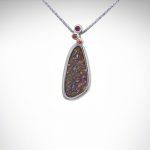 This colorful opal is set in a contemporary 14Kt white gold pendant accented with playful orange sapphires and a pink tourmaline. The incredible natural colors in this rare tanzanite range from a sea blue to a deep purple with green undertones. 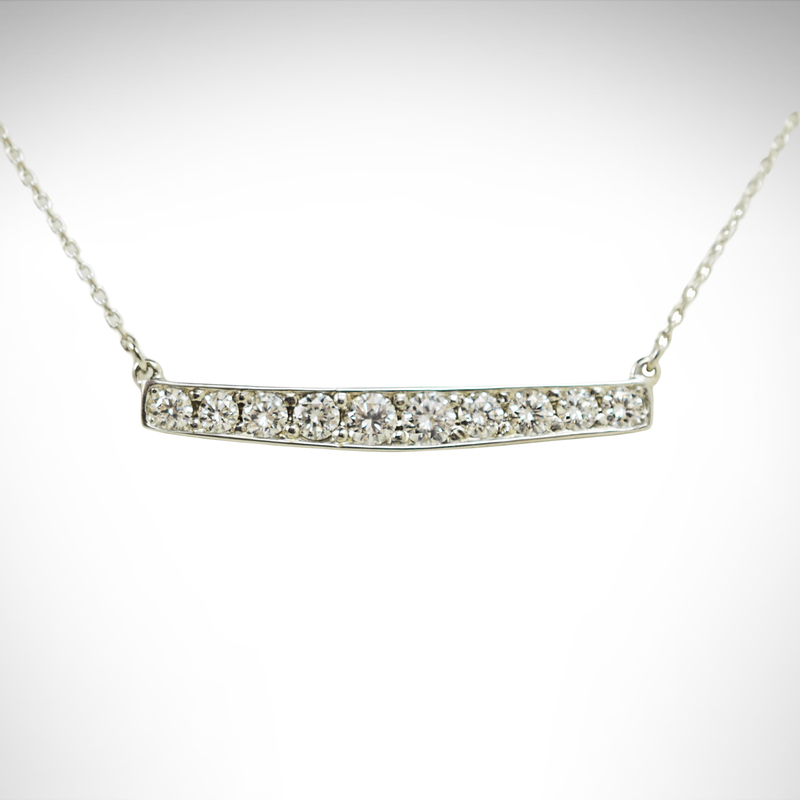 Set in brushed yellow gold with a row of pavé diamonds trailing from the stone. This sapphire is the most lovely shade of blue, accented with diamonds in an open design Palladium band. This checkerboard cushion-cut tourmaline, in a warm red with hints of purple, hangs from an intricate bail in 14Kt white gold. 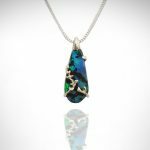 Green Tsavorite garnets complement the crystalline path in this fascinating boulder opal. This large gemstone is set in 14Kt yellow gold with gypsy set diamonds on both sides. 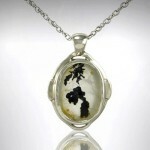 A translucent oval quartz features dendrite (tree-like) inclusions, giving this piece an organic look. Framed in a 14Kt white gold setting. 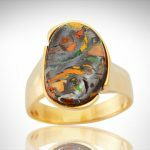 This fantastic boulder opal has a glittery appearance and catches the eye with its array of rainbow colors. 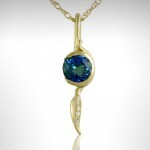 The setting is 14Kt yellow gold accented by a row of pavé set blue sapphires and diamonds. 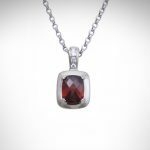 A lovely cushion-cut garnet in a classic 14Kt white gold pendant with a row of diamonds in the bail. 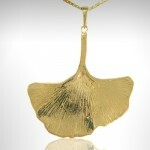 14Kt yellow gold hand-carved ginkgo leaf pendant with a beautiful texture and highly polished, reflective finish. The vibrant blues and flashes of green set this opal apart. 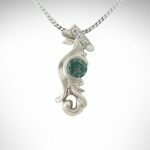 Set in 14Kt white gold with an organic leaf design dancing across the gemstone. 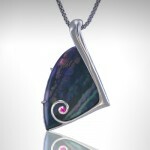 The arms of the band swirl around this round striking purple sapphire stone to form a half-bezel. Accented with pavé-set diamonds on both sides and set in 14Kt white gold. 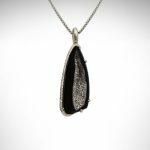 This carved black druzy is set in a minimalist white gold pendant setting, with a hand-carved leaf accent hanging from the bail. The unique shape of this black opal resembles a butterfly wing. 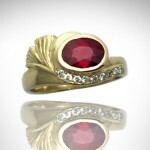 This stone is enhanced by the 14Kt white gold setting and a ruby accent. 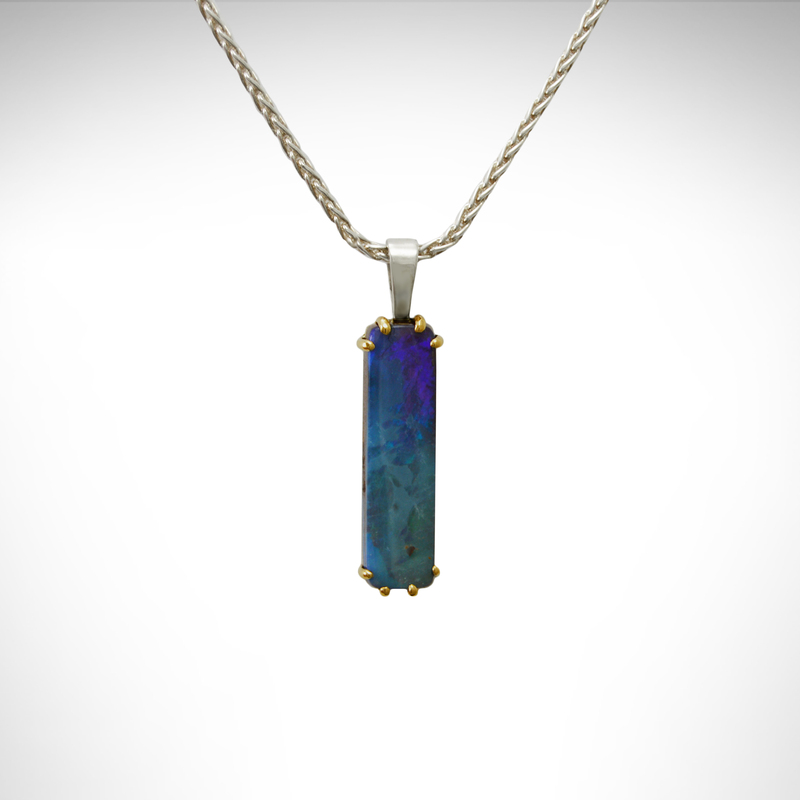 A stunning opaque blue opal nestled in 14Kt yellow gold with gypsy-set blue sapphire and diamond accents. 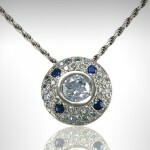 A circular pendant encrusted with diamonds and sapphires with a bezel-set, large center round-cut diamond. The 14Kt white gold enhances these pavé-set stones. 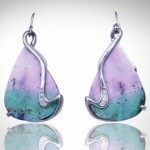 This gorgeous stone radiates brilliantly with fuchsia and purple with flashes of green and aqua. 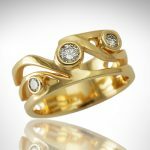 Set in 14Kt yellow gold with diamond accents on one side. 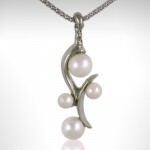 This perfectly balanced, organic looking white gold pendant contains four round white pearls. 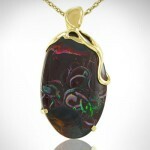 A stunning large Black Opal stone is glowing with deep purples and flecks of green in the shifting light. Nestled in Art Nouveau-inspired two-toned vines with a Morning Glory flower and two leaves. 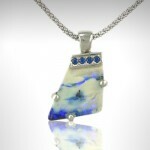 The charming sapphire stones perfectly balance the coloring in this white and blue boulder opal. Set in 14Kt white gold with 3 prongs and a bezel-ed top edge. This beautiful cushion-cut garnet found in a refreshingly bright mint green in a split prong setting with a one-of-a-kind 14Kt yellow gold Celtic style band. These Art Nouveau inspired earrings, in 14Kt white gold, are set with diamonds to accent a one of a kind pair of boulder opals, with shades of light pink, turquoise, and flashes of green. These naturally dark colored pearls reflect shades of pink, green, and grey! 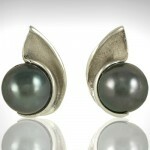 Set in an organic shaped 14Kt white gold with contrasting sandblasted and polished finishes. 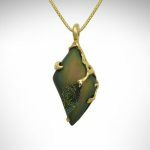 This custom pendant has a free-form design that wraps around the large stone. This Australian boulder opal reflects all colors of the rainbow – especially greens, blues, and reds. 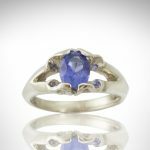 A white gold Celtic inspired band cradles this large oval Tanzanite. This stone has a phenomenal blue-violet color. Four stones are aligned in a row, with rows of white gold trailing between the stones. A great way to showcase your spare diamonds! 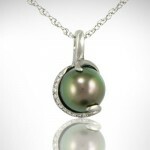 This pearl clasp contains four different colors- yellow, white, rose, and green gold! 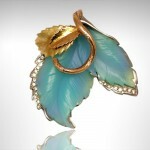 Two leaves and a vine wrap around a perfectly carved blue chalcedony stone with diamond accents. A uniquely designed 14k white gold pendant with three prongs holding this beautiful blue-green boulder opal. This beautiful druzy has been deposited with platinum to highlight its crystal structure. 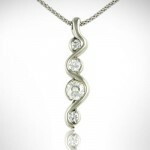 Set in 14Kt white gold, this pendant is accented by a diamond at the bail. 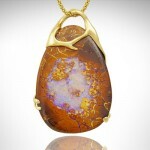 A large beautiful boulder opal set in 14Kt yellow gold with a natural branch-like design. The branch design continues on the back which makes this pendant reversible! 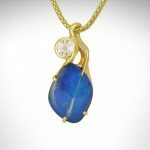 This stunning blue sapphire is set in a flowing, nature-inspired 14Kt yellow gold pendant. 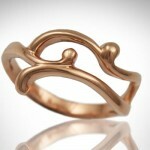 A free-form, graceful design, in the warm tones of 14Kt rose gold. 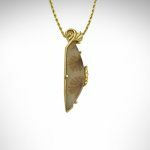 This leaf cut druzy is surrounded gracefully by 14Kt yellow gold with diamond accents to highlight the natural sparkle of crystal structure of the druzy. 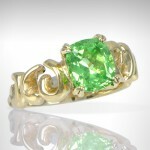 This emerald is of exceptional quality with its rich, saturated color. The 14Kt gold setting is designed with contrasting finishes. This timeless piece is one to be passed through generations. 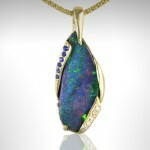 This vibrant multi-colored opal is displayed in a design of 14Kt gold with an accent of pave-set diamonds. 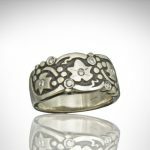 This 14Kt white gold ring features a carved relief pattern of grape vines and leaves. 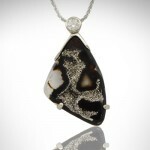 The antiqued black background adds contrast and diamonds add sparkle. 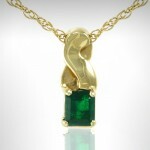 This flowing 14Kt yellow pendant is set with a unique green sphene gemstone. 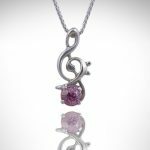 This 14Kt white gold pendant portrays a combination of bass and treble clefs, with an unusual purple sapphire. This 14Kt gold pendant is set with four birthstones, representing each of this mother’s children. 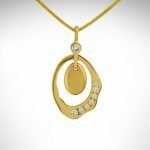 This artistic pendant in 14Kt yellow gold is designed with a brushed finish on the center oval, framed by an organic scalloped design with diamonds. or contact us about a custom piece of your own! We have created many rings, pendants, earrings, bracelets, and brooches. 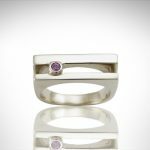 Looking for a custom-designed engagement ring, wedding band or anniversary band? Click here to explore the possibilities!